Top quality imaging and outstanding reliability! 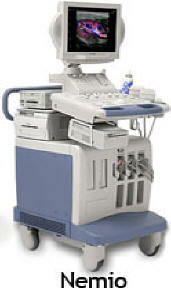 ultrasound systems. We also stock a complete line of all preowned Toshiba equipment for the worldwide marketplace. When it comes to clinical capabilities and ease of use, Toshiba's Nemio XG ultrasound system combines powerful performance and flexibility. Nemio's small footprint and modular design allows portability wherever it's needed. Incorporating a wide range of proven, high-performance features, Nemio provides image quality you would expect from much larger systems.Nemio XG really delivers when it comes to streamlining workflow and boosting efficiencies. All the information you need for making decisions is right at your fingertips along with options to store, report, print and archive images and information right on the system. * With Nemio XG's TwinView feature, B-Mode and Color Doppler Images are displayed as side-by-side real-time images, resulting in a quicker diagnosis, increased efficiency and reduced scan time. * Advanced Dynamic Flow™ increases Color Doppler resolution to reveal minute vasculature with unprecedented accuracy and detail. Elevating ultrasound to a higher level of performance, Aplio XG is a full shared service, premium ultrasound system for increased diagnostic confidence. Aplio XG expands clinical performance and improves patient care with advanced, innovative technologies that include a comprehensive set of advanced applications to address today’s clinical needs. The system’s many features make it today’s most intelligent solution for satisfying robust imaging requirements while simultaneously boosting productivity.Volumetric imaging provides the ability to view multidimensional images in any plane similar to CT and MR. A transducer automatically captures volume data sets as it scans areas of interest 4D imaging adds a valuable new dimension to diagnostic ultrasound consisting of clear, continuously updated 3D images. Thank you for viewing our site!